Easily separate and identify Class III combustibles using these red safety cabinets. 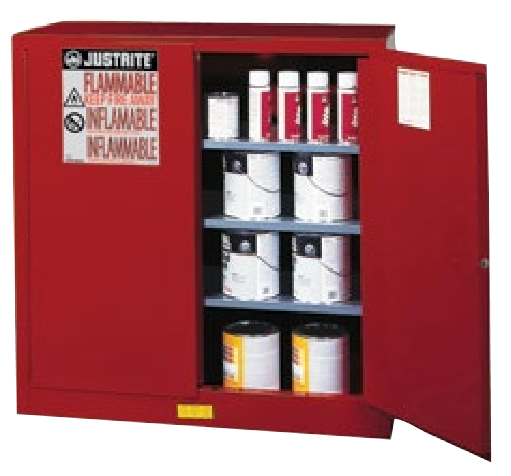 Adjustable shelves accommodate many smaller paint tins, aerosols and inks found in printing, painting, furniture and motor vehicle operations. Cabinets feature sturdy double-wall, 18-gauge (1-mm) steel construction with 1-1/2-in (38-mm) of air space and dual flame arresting vents. Cabinets are also available in 20-, 60- and 96-gallon (76-, 227- and 363-L) sizes—ask your distributor for details.